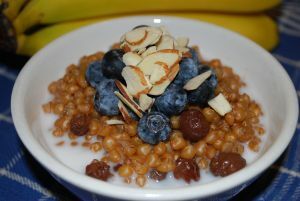 Wheat Berry Breakfast is a crock pot recipe for hearty meal with apricots, raisins and spices. Place everything in the crackpot the night before. Cook on low all night. Serve in the morning with berries and nuts.